Research In Motion (RIM) the makers of BlackBerry smart phones today announced a big refresh of the Twitter-BlackBerry smartphone beta application. There are several new features added with this software version, including auto @username completion, viewing geotagged tweets with BlackBerry Maps, direct access to other user profiles and a personal info guard that stops users from accidentally sharing sensitive info like PIN numbers or email address. There are also some basic support updates for photo viewing ability to both view tweeted photos from YFrog and TweetPhoto and new navigation hotkeys. Quote Tweets-: Ability to edit ReTweets. Auto Complete-: @ Usernames-:While tweeting, when you type an “@” followed by characters, the auto complete feature pops up a list of users as you type. This is a handy tool for quickly adding a long username or if you can’t quite remember how to spell a friend’s handle. Go to User-: Users can now access Twitter profiles from anywhere within Twitter for BlackBerry Smartphones using the auto complete feature mentioned above. Additional Photo viewing support-: In addition to Twitpic support, users now have the ability to both view tweeted photos from YFrog and TweetPhoto! Personal Information Guard-: Keep your personal information safe! A warning appears in Twitter for BlackBerry Smartphones when personal information (e.g. email address, PIN, phone number) is about to be shared. 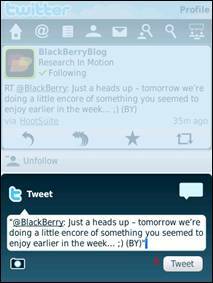 View Geotagged Tweets-: Twitter for BlackBerry Smartphones allows users to add geolocation to their tweets. In the new version, the locations of geotagged tweets can be viewed using BlackBerry Maps.